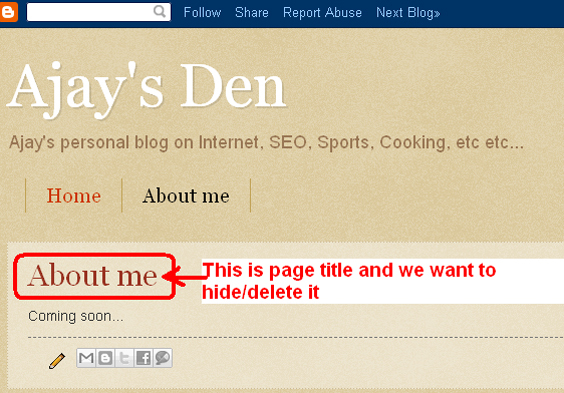 Someone asked me how to delete page title in blogger (blogspot) template. Requirement was not to show the Page title on pages. I thought deleting title will be piece of cake. I’ve worked with Blogger template before and it was my guess that by deleting a line or few lines in the template will solve the problem. However to my dismay it turned out to be hours long marathon Googling and I’m yet to find a solution for it. In wordpress it is so easy that you can do it with closed eyes. In Blogger template it is not so easy. Blame it to the template structure. 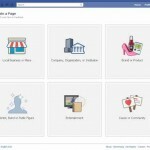 Most blogger templates use same code for both page and post titles. So you can’t delete one without affecting other. If you try to hid the title using clever CSS techniques then it will hide the post titles as well. There is a solution posted on Blogger support forum – Blogger – Remove Title from pages. I tried but it didn’t work. I’m yet to find a solution. If I find I’ll post it for the make benefit of the glorious users of Blogger (sic). OK I’ve found a solution, it is crude but it works. The solution to is to hide page title using css from inside the page content. In the blogger Edit the page Click on HTML tab and add following at the top of page’s content. So far so good. 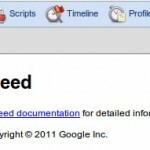 However you will immediately ask next question, how to remove the space where page title was. Notice no post titles on any pages! voila. no more page titles! Thanks for the link though. it really helped! Thanks man, this trick was really helpful! Thank you so much for this – it worked like a charm! 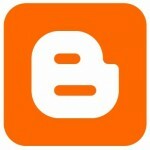 I have created a blog allzindia.blogspot.in . I am seeing two titles of my blog. I tried everything to remove one of the two titles. But no anything worked. Can you please help me with it?